Synopsis: Prakash, a revenue inspector lived happily with his wife Kamala, sister Kantham and son Kittu till his neighbour Venkaiah's young second wife Anasuya brings dishormony in his marital life. She has a step daughter Bobjee who tries to scuttle the plot. Prakash has a wealthy friend, the popular singer Kamaraju. Anasuya has a crush on Kamaraju but he spurns her advances and a humiliated Anasuya plots revenge with the help of Mangapathi, a local rowdy. They spread rumours about the amorous relationship between Kamala and Kamaraju. Hurt by these rumours, Kamala attempts suicide but is saved. Kamaraju with Rathnam finds out that the handwriting on the love letter supposedly written by him and Anasuya's are similar. The truth comes out. Synopsis: Purushottam (YV Rao) embezzles money from a firm of brokers owned by Padmanabham in order to get his son Mohan Rao married to Hemalatha, daughter of the millionaire Vishalakshamma (B Rajaratnam). The now impoverished Padmanabham partially gets his own revenge when his daughter Sushila (Lalitha Devi) becomes a film star Vishwa Mohini. The film producer Pashupati, brother of Vishalakshamma, introduces her. The star Vishwa Mohini falls in love with Mohan Rao and her father agrees to their marriage provided Mohan can find a job. He pretends to have done so and the two get married. Hemalatha offers money to Vishwa Mohini to go away and free Mohan, which, in an emotional scene, she refuses to do. Synopsis:Ravana keeps Sita captive and Mandodari pleads with him to release her and also warns him not to have enmity with Lord Rama. Ravana rebukes Mandodari and seeks the help of Pathala Lankeswara Mahi Ravana to kill Rama and Lakshmana. Anjaneya builds a fortress using his tail to safe guard Rama and Lakshmana. But Mairavana with his mystical powers brings them to Pathalaloka. The Naga princess Chandrasena, a staunch devotee of Lord Rama was held captive by Mairavana who wishes to marry her. With her help Rama kills Mairavana. 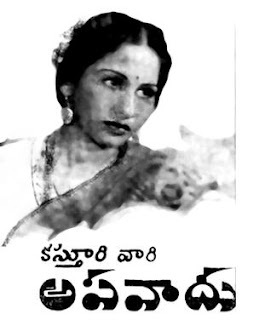 Notes: This was the debut film for Ch.Narayana Rao. The film was a successful and he became one of the most glamourous heroes at that time. Synopsis: Indira (Kanchanamala) is happily married to Murthy (Umamaheswara Rao) till Murthy falls in love with an educated and sophisticated Leela (Lakshmi Rajyam) and brings her as his second wife. This naturally leaves Indira in pain and anguish. However she performs her duties as the devoted wife on one side and wins over her 'savathi' on the other with patience and perseverance. Leela undergoes a change of heart before fate plays with her life. Finally Indira emerges triumphant. To take the story forwared there are other characters like the romantic poet, Madhu (Saluri Rajeswara Rao), and his spouse Sarala (Rao Balasaraswathi Devi). Notes: Garikapati Varalakshmi from Ongole, was left home to act on stage in Vijayawada when she was 11 years old. She acted along with drama artists Tungala Chalapathi Rao and Dasari Kotiratnam and became popular for her roles in plays like Sakkubai and Rangoon Rowdy. Her first movies are Barrister Parvatheesam by Producer Raghupathi Prakash and Bondam Pelli by Producer H.M. Reddy, when she was 14 years old. Synopsis: Raghu (Nagaiah), an unemployed graduate, insists on marrying a village girl Janaki (Kanchanamala) despite the opposition of his scheming mother who wants a dowry. Raghu's unemployment problems continue despite his migration towards city, leaving his wife in the clutches of her mother-in-law. When Raghu wins a lottery for Rs 5 lakhs and returns home, he finds his wife and infant son have left. Although his mother insists he marry again, Raghu goes to the city and dedicates himself to social work, including building factories in order to create employment opportunities. In this his rich female college friend, provoking gossip around their relationship, assists him. Raghu's wife, now a poor flower seller, sees her husband with his new friend and believes he has married. Eventually the misunderstanding is revolved. Notes: Kalyanam Raghuramaiah was born in Suddapalli, Guntur District in 1901. He debut on stage at the age of 8 as Raghurama in 'Bhakta Ramadasu'. He acted in over 100 films. Synopsis: Lawyer Jagannatha Rao Panthulu (Balijepalli Lakshmikantham), fearing that Sarada Act (which prohibits child marriage) may come into force, gets his six-year-old daughter Lalitha (Kanchanamala) married to an elderly person, who dies and she becomes a child widow. Rao is against any social reforms and wields considerable influence in the area. He hosts a Swamiji, Kaliyugananda. People throng to his house to have the Swamiji's darshan. 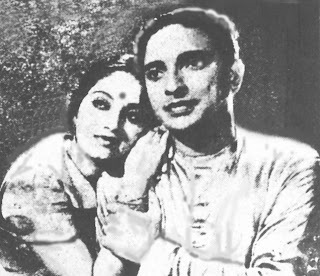 Sundar Rao (YV Rao), an unemployed graduate, stays with his sister Kamala (Bezawada Rajarathnam) in the opposite house. Kamala and Lalitha become friends. Soon love blossoms between Lalitha and Sundar Rao, who decides to marry her. 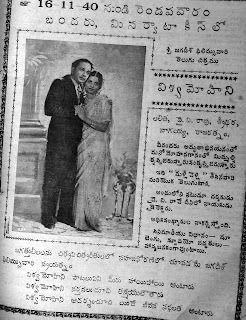 Jagannatha Rao's nephew Venkata Rao (Kocharlakota Sathyanarayana) and Kamala are also in love. 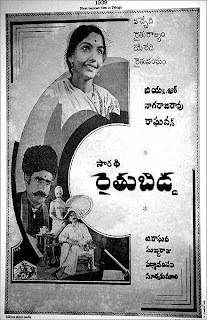 Trivia: This was the first film to Saluri Rajeswara Rao as a music director. He was just 17 years old at that time. Trivia: This movie also named as SRI VENKATESWARA MAHATYAM. Notes: Niranjan Pal was the son of Indian nationalist Bipin Chandra Pal. In his teens he was attracted to the young extremist movement in Calcutta, and in an altercation with a British officer, beat him up and stole his gun. With an arrest warrant out on him, he escaped to London, where he was lived with nationalists Veer Savarkar and Madanlal Dhingra (later executed for assassinating a British officer). 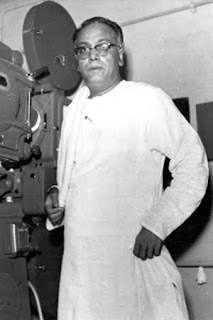 He studied script-writing in London, and was eventually discovered by Franz Osten and Himansu Rai, with whom he went set up Bombay Talkies, one of India's first and most important film studios. His autobiography "Aye Jibon" won the President's National Award in India in 2001. Notes: B. Narayana Rao's original name was Balakrishnan Narayana Nair. He was from Tellicherry. Notes: This was the first film made in 'vaduka bhasha' in Telugu. It was released in theatres along with 'Kasula Peru', documentary on Annavaram Satyanarayana Swamy Temple and 'Chal Mohana Ranga', a folk dance. 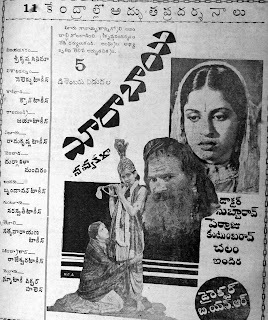 Kallakuri Hanumantha Rao, Sundaramma, Srihari and Tulasi were the actors in 'Kasula Peru' while Pushpavalli and Vali Subba Rao were performed in 'Chal Mohana Ranga'.